In the summer of 1969, a young Sussex filmmaker took up residence in a van in a wood at Swanbrook, near Chiddingly. He was there to film a family - the Pages - who lived in an isolated and ramshackle house that had no electricity or running water. The head of the family was Mr Page, a gnomic man in his seventies, who lived with his four grown-up children - two boys and two girls - and earned a living repairing old farm machinery with his sons. His daughters kept house, such as it was, gardened and played musical instruments. 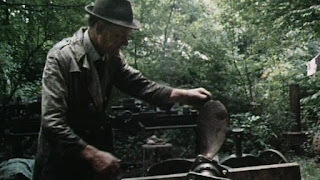 The 65-minute documentary that Phillip Trevelyan finally completed in 1971, The Moon and the Sledgehammer, offers a fascinating glimpse into a way of life that was already long dead when Trevelyan befriended the family having heard of them through an acquaintance. The film is shot using natural light, which gives it a magical, otherworldly quality; it has no narrator but is instead voiced with the family members’ answers to Trevelyan’s interview questions. However, Mr ‘Oily’ Page is its star and it is his expression of his rejection of modern technology and loyalty to traditional tools and mechanics that provides the film’s title – the first moon landing was a contemporaneous event. The family’s self-sufficiency and woodland life seems idyllic and the film has acquired a cult following for its back-to-the-land ethos but there is a sense from some of Oily’s children that life was passing them by and they longed for escape. After Mr Page and his eldest son had died, the daughters were moved into social housing in the 1980s, leaving the remaining son to cling on in the wood. What has become of them now is not known; it is thought that, just like their simple existence, they have not survived into the 21st century. The film and a documentary about its making are both available on DVD here.